The Easton Roller Mill sprang back to life in 2013 with tour days held twice each month from June through September. 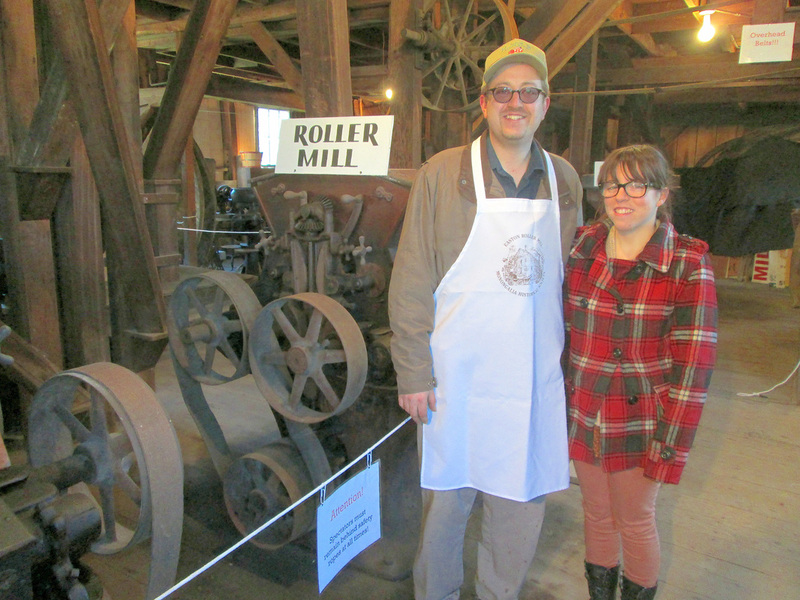 Society member Don Annonio and his co-worker and fiancé, Caroline Rutherford, accomplished major adjustments and renovations to return the mill machinery to operation. Tours included guides discussing the history of the mill. Highlights were demonstrations of the mill engine turning wheels and connecting belts which power the grist stones, corn crusher, roller mills, and elevators carrying the products from floor-to-floor during grinding and processing. The Easton Roller Mill was placed on the National Register of Historical Places in 1976 and has been owned by the Monongalia Historical Society since 1980 when it was donated by the Ley-Pickenpaugh family. The mill is one of the few remaining steam-driven mills of the Mid-Atlantic area, and is in especially good condition, largely because of the care and renovations of the many Historical Society members who volunteered their efforts since its acquisition. The members of the Society who have participated in its preservation should be proud of what has been accomplished and that the mill is enjoying a new lease on life. Also, credit should be given to the Society Members whose dues and donations have provided funding, and to the George D. Hott Memorial Foundation, the John Mathew Gay Brown Family Foundation, and the Monongalia County Commission for their continuing financial support for mill maintenance, repair and operation. From January, 2000 through December, 2012 the Society has expended $189,216.18 of which 55% was for mill expenses. This included the major expense of designing and constructing the floodwall that protects the mill from West Run.